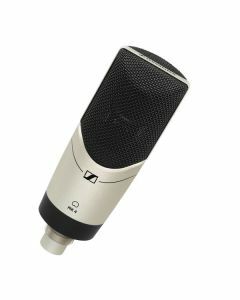 The Sennheiser MK 4 is a large-diaphragm, true condenser microphone engineered for professional studio recordings. Delivering luxury resolution and terrific sound quality, the MK 4 provides superb value for money – it’s therefore an ideal choice for professional project studios and home recordists alike. The MK 4 has a large 1" diaphragm specifically flecked with 24-carat gold. Its robust metal housing with nickel finish, and elastically mounted capsule, make the microphone tough enough for the most high-stress recording situations. An internal capsule mount offers first-rate suppression of handling noise, which can be further improved by the use of an elastic shockmount. The open front of the suspension mount makes it possible for the MK 4 to be located as close to the sound source as you like. The MK 4 has a maximum sound pressure level of 140dB, and extremely low self-noise: 10dB, A-weighted. The highly adaptable MK 4 is perfect for anything, vocals to grand piano, and in numerous field trials it has proven to be a superb microphone for guitar amplifiers and percussion. Additionally, the MK 4 comes with a microphone clip and a protective pouch.